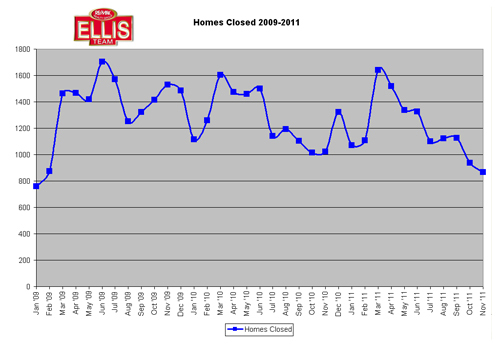 As we’ve been reporting in our weekly article, we expected sales to be down as pending sales have been declining. We also expected prices to be higher and in fact official SW Florida single family home median sales prices released this past week were up 4.11% over October’s prices and up 20.11% over last November’s price. Everyone wants to know what kind of year 2012 will be, and what kind of season it will be. Nobody can predict the future with absolute certainty, so we have to look at clues as to what will drive the market going forward. There are opposing forces in play affecting our market, and each one can have an influence, The question will always be how much influence will each force play and to what degree? Overall economy-It is weak and this is an election year. In previous election years activity slowed as people weren’t sure of the outcome and its effect on tax strategies and the government’s effect on the economy. The housing market likes a pro growth government. Employment-More jobs eventually equals more disposable income in our local economy, which spurs home sales. Unemployment is still high in the area, so we’d like to see jobs. One such employer might be a casino, or perhaps a company that may relocate to our area. World Markets-People wonder what the trickle effect would be to the US economy and value of money should Europe’s debt crisis spill over. Europe is working on their debt crisis and the US is helping, but we can’t seem to get our own debt crisis in order, so I wonder what influence we have to help them when we can’t help ourselves. Interest Rates and Availability of Credit- For now they are low, so anyone that can afford to buy now should. Prices are rising and rates are at all-time lows. Banks have also tightened standards, perhaps too much, which affects sales in the mid and upper ranges. 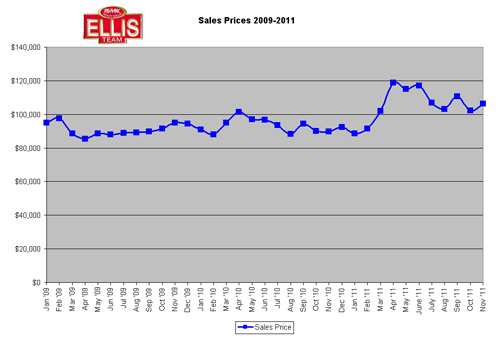 Volume- Sales have been falling as prices have risen. We set all-time records in 2009 as prices were at rock bottom. Our market has definitely moved off the bottom, especially at the first time home buyer end. Many properties still make sense on a cash flow basis; however fewer investors are buying because the rock bottom deals are gone. Correctly Priced Inventory- We have less distressed sales on the market, which is good. However, inventory is rising because not every home is priced where buyers are willing to buy, so they sit on the market. This is nothing new. It just illustrates we are still in a price sensitive market. If you overprice a home, it will sit. If you price it at market, it will sell. Season Begun Early- We saw our Northern friends start their search earlier this year. The beaches and roads are packed. The weather up North is cold. Baby boomers aren’t getting younger. Many like the deals they’re seeing and many are saying this is the year they’re going to pull the trigger and buy. Florida has been on sale for a few years now and buyers see the rising prices, giving them confidence the worst is over. Greed-Greed isn’t always a bad thing. It’s emotional feeling people use to guide them to buy or sell. It’s the reason sellers overprice, and it’s also the reason buyers buy. A transaction won’t happen if both buyer and seller are operating from the same emotion. The answer to this emotion is facts, data, and logic. If a seller prices appropriately, buyers will buy because they fear prices will be higher in the future, and they don’t want to miss the boat. They will not overpay though unless they’re convinced prices for home will be higher. Greed is one emotion fueling buyers to buy today. If a property is priced at market, they are motivated to purchase. If a property is overpriced, it forces the buyer right back on the fence. All 10 factors are in play. Only the future knows how each factor will affect the market. There are probably a few wild cards we haven’t mentioned as well. All we can do is watch together. Enjoy 2012. We think it could be a good year. Posted in Southwest Florida Real Estate.Tagged Brett Ellis Ellis Team RE/MAX Realty Group, Fort Myers Florida.